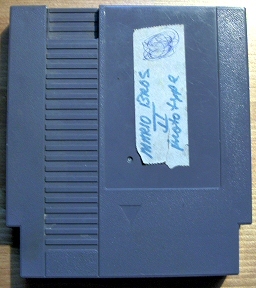 The Super Mario Bros. 2 prototype marks a rare find. The cartridge was purchased by Johan_1984 on eBay in 2005 for $350. We would like to thank Johan_1984 for his huge contributions to this page. 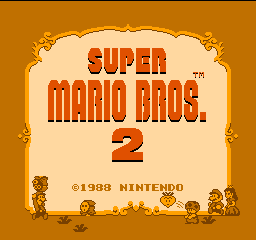 The following comparisons use several different versions of Super Mario Bros. 2. 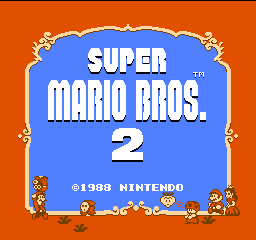 For more information on these versions, please refer to our SMB2 Madness special and Doki Doki Panic & Super Mario Bros. 2 comparison. The SMB2 prototype represents a true transitional phase between Doki Doki Panic and the final version of Super Mario Bros. 2. Here are some photos of the prototype, inside and outside. 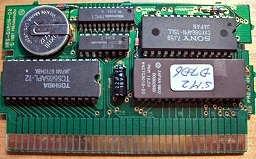 Notice that the prototype uses an SNROM-02 board rather than the final version's TSROM-04, meaning that it uses CHR-RAM instead of the usual CHR-ROM and also contains a battery. 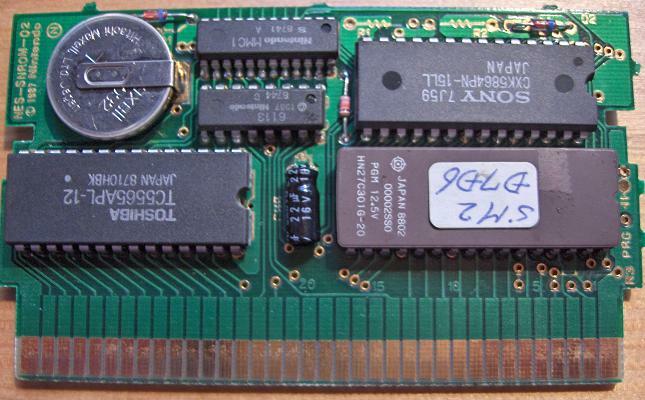 The ROM was also only 1 Megabit rather than the released version's 2 Megabits. Click the images below for a larger view. 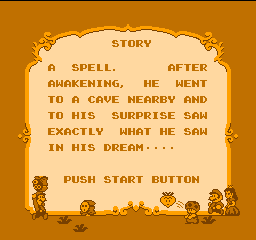 The prototype version of the story is slightly different from the final version. In particular, "faint" was removed and "he" was added. 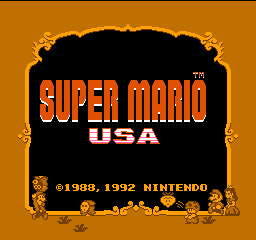 The colors on the title screen were also changed, though the orange border was brought back for Super Mario USA and was also used for the Bonus Chance screen. 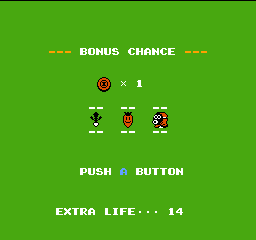 Ellipses found between the words Extra Life and the number of lives was mysteriously removed from the final version of the game. 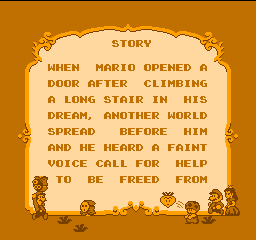 It was restored in Super Mario All-Stars. In addition, players start with 19 lives rather than the standard 2, likely for testing purposes. The curtains in the prototype version are slightly flatter than the final version as well. 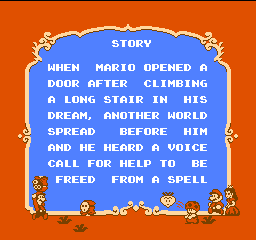 This screen was featured in the first Nintendo Power. 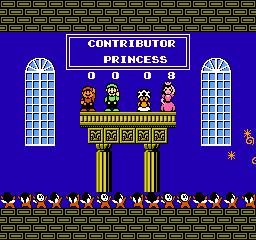 Both Mario brothers as well as the Princess sport sclera in the final version of the game. They hadn't been added yet in this prototype. 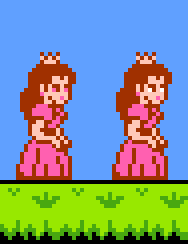 Considering these sprites are found with the animated sprites in the final version, this is no surprise. 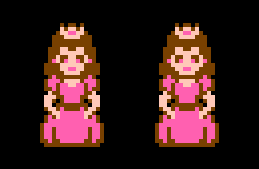 The Princess's hair is different when she is facing the screen. 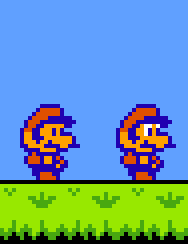 This same sprite was featured in an early Nintendo Power. 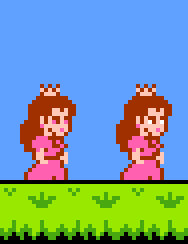 While squatting, the Princess's face also looked significantly different. 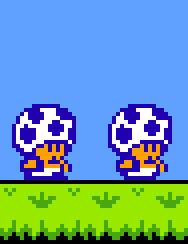 Small Toad's feet are different. 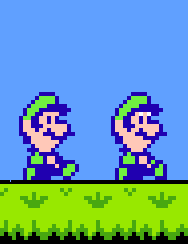 Small Luigi's foot in his running animation was also different. 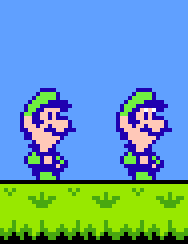 Finally, Luigi's doesn't move his legs as rapidly during his floaty jump. 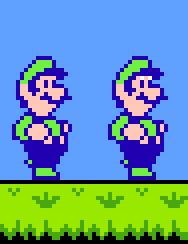 The height at which objects are carried is different in this version except in the case of Big Luigi. 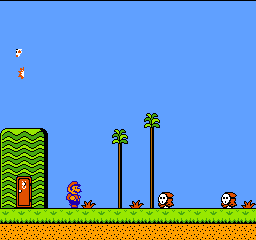 The Mario games' characteristic B button run does not exist in this version. 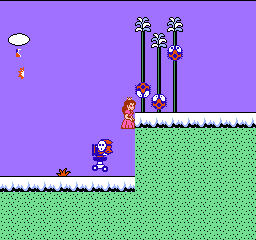 It was absent from Doki Doki Panic as well. 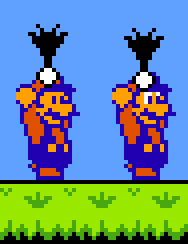 At this point in development, the characteristic animations had not yet been added to Super Mario Bros. 2. Though many sprites were already in their Mario incarnations, like Doki Doki Panic, POW blocks, cherries, vines, grass, crystal balls, bomb fuses, water, and spikes are not animated. 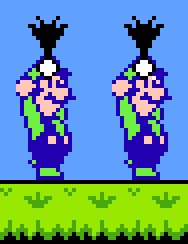 Albatosses also only have two frames of animation as the original game. 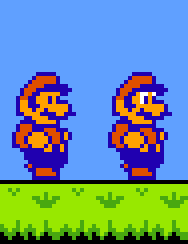 These additional animations likely contributed significantly to the increase in ROM size. 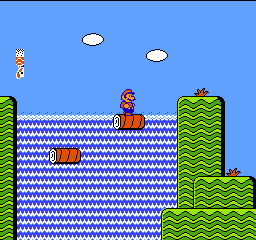 Speed of waterfalls was changed in the final version of Super Mario Bros. 2. 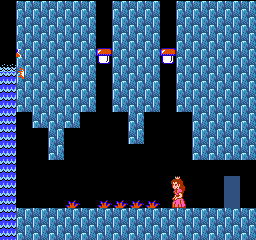 Here water falls at the same speed as in Doki Doki Panic. 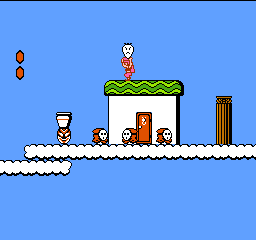 In the final version of the game, the lamp was replaced by potion. The lamp is still the Sub-space door creation item in this version. 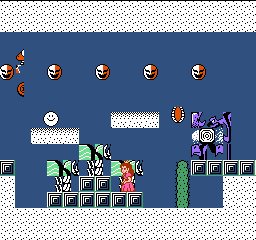 The scowling vegetable from World 7 that was changed in the final version of the game is still in its Doki Doki Panic incarnation in this prototype. 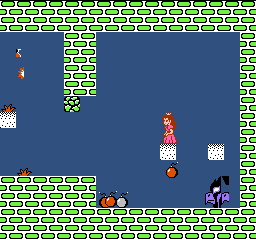 The Mushroom Blocks found in World 5 were given spots in the final version of the game. 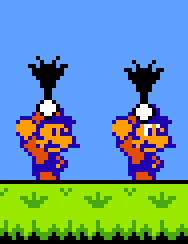 In the prototype, they are the same as the ones found in World 1. 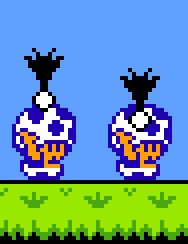 Though Phanto looks the same in the prototype as in the final version and still flies off the wall to chase you, he does not make a sound while coming to life. In 7-2, Phanto does not appear in the room where Birdo is holding a key like in Doki Doki Panic, but unlike the final version of SMB2. 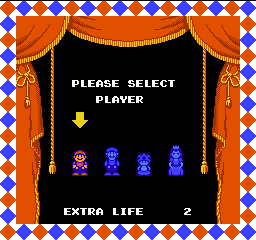 Like in the Super Mario All-Stars version of SMB2, the prototype allowed players to choose their character after dying. 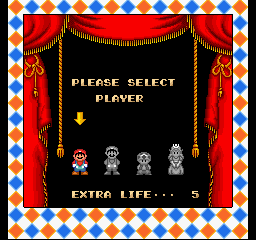 The prototype offered unlimited continues, while the final version limited players to two. 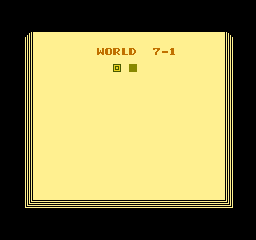 The "World #-#" text is slightly offset compared to the final version. In addition, the scenery is missing from World 7 completely. 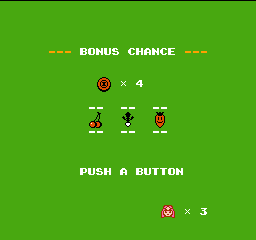 The Bonus Chance screen remains very close to the bland green version of Doki Doki Panic. 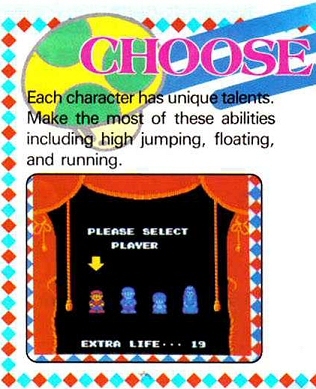 Only the Extra Life indicator was changed and the A in "Push A Button" was highlighted. 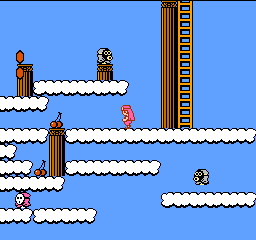 In Doki Doki Panic, there was an extra cloud and column in the Snifit-infested area. In the prototype, the shortest column was removed and the longest one was moved to the right. 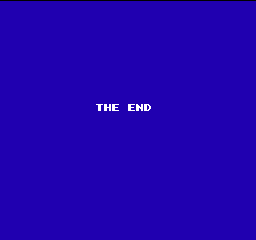 It was changed again for the final version, where developers also removed the cloud and repositioned the Snifit. 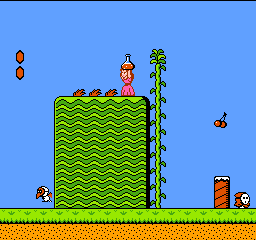 Wart is defeated with only four vegetables in the prototype version as opposed to six in the final version of SMB2. 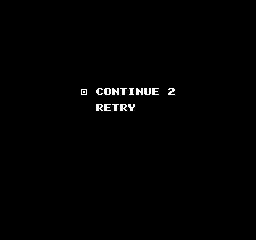 Four was the number required in Doki Doki Panic as well. 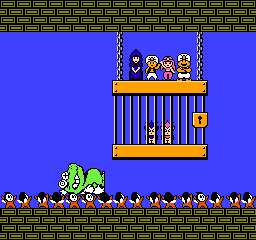 When the Subcons are released from the jar, a Thank You message is displayed as in Doki Doki Panic. 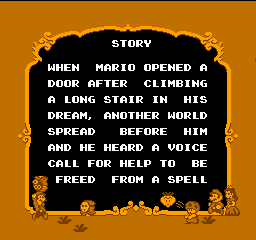 This message was removed for the final version of the game. 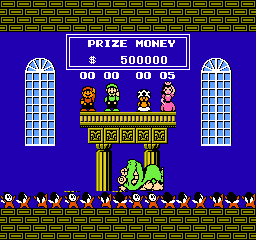 At the end of the game, players are rewarded with "Prize Money" depending on how many times players died rather than an indicator of the biggest contributor. 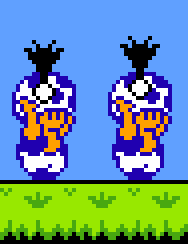 After Wart is beaten off screen, the Subcons do not turn around to celebrate even though they do this in both Doki Doki Panic and the final version of SMB2. 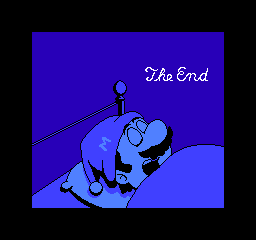 The game ends at the celebration in Subcon and does not continue into Mario's dream sequence, ending on a simple "The End" screen. 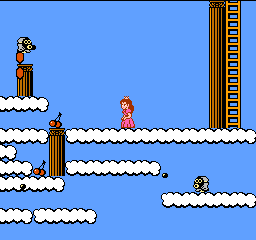 Since the Mario scene does not appear, the remixed version of the Doki Doki Panic intro music is also absent. One of the neatest changes involves the music. 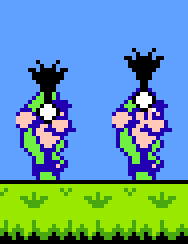 The percussion track of the Starman music is close to the "scratchy" original SMB rendition rather than the "wood block" SMB2 rendition. The underground music has been completely changed. 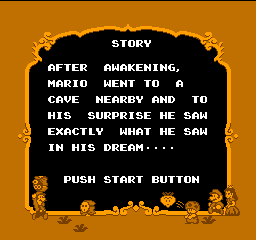 In the prototype, the music is similar to the SMB3 remix of the SMB underground music. However, the music then speeds up and more percussion is added. 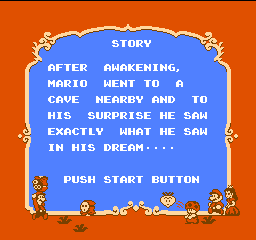 There wouldn't be a remix like this again until Super Mario RPG. 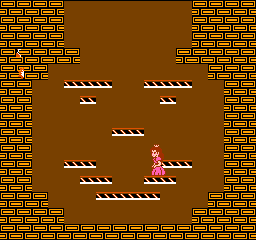 The final version was a modified version of the original Doki Doki Panic underground music. 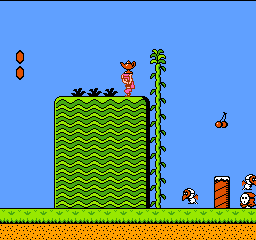 In the prototype, the sound generated by throwing a shell against the wall is the same as the sound Birdo makes when getting hit. 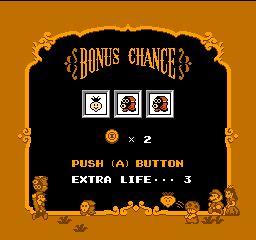 In the Bonus Chance, the sound for winning extra lives is the same as the 1-up Mushroom sound in the prototype instead of the fanfare sound found in both Doki Doki Panic and the final version of SMB2. 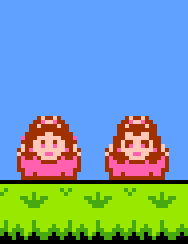 Birdo's egg-spitting sound occurs a half-second before he actually shoots the egg, as in Doki Doki Panic. 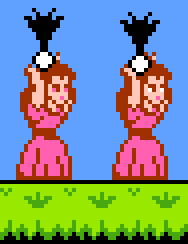 In the final version the sound comes simultaneously with the egg ejection. 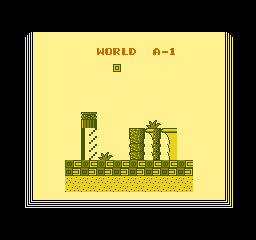 Starting world could be selected by pressing A once on the title screen for each world to be skipped. 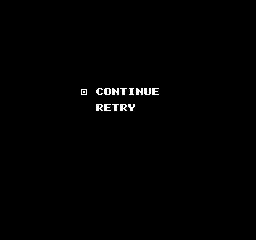 There was no limit to the number of times A could be pressed, however, leading to the ability to start on invalid worlds much like the minus world of Super Mario Bros. 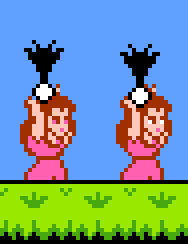 Pressing select gives the player 15 hit points before shrinking. 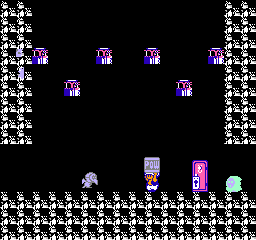 The life bar shows garbled sprites, which depend on character and how many hits are left. The counter wraps around, though, so grabbing a small heart with 15 hit points left actually shrinks the character, giving only one hit remaining on the life meter. 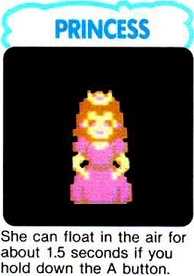 This debug feature was actually present in the Super Mario Bros. 2 commercial! While on the player select screen, scrolling fast between the characters and simultaneously pressing A can cause the arrow or both the arrow and limelight to indicate a player other than the one actually selected. 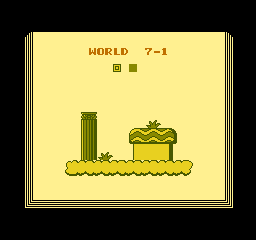 In Worlds 2 and 6, there are areas where players must dig down through sand. 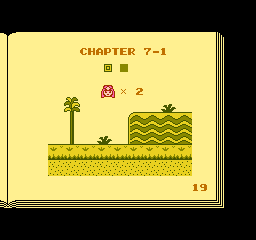 Picking up an enemy on the 9th sand level and throwing it into the sand causes it to disappear. Similar to the previous glitch, in 7-2 outside of the castle, the Tweeters will disappear when they run into the left side of the block structure. 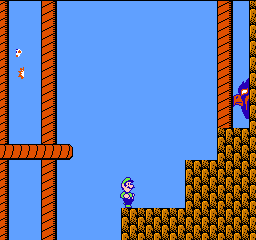 Luigi jumps into the middle of the jar to release the Subcons. Toad jumps across and out of the room, re-entering through the floor and flying inside of the left wall. 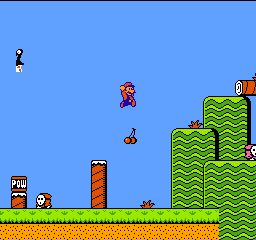 After he has pulled out the plug, he continues to make vertical jumps over the screen and comes back through the floor. 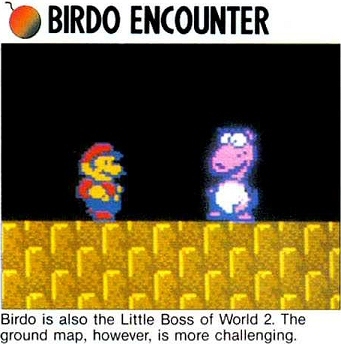 The very first Nintendo Power issue, July/August 1988 featured Super Mario Bros. 2. 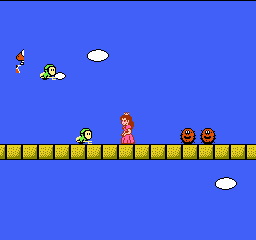 Many of the screens shown are actually from the beta version of the game.